JT Stitches: Busy, Busy, Busy! I've been super busy lately. I got hit with a bunch of orders, one being a 10 scrub top order & others from previous ebay customers. It felt good to get emails from people that have bought from me before on ebay, saying they have ordered from me before (from my ebay shop) & wanted to know how they could order more for a friend since I no longer have a shop on ebay. I'm also planning on making my first quilt. I bought a book from amazon "Complete Guide to Quilting"
This book probably is so thick & has EVERYTHING you need to know about quilting! I'm not sure it's the kind of book you can just sit down & read cover to cover, it's more of a reference--when you are doing this with your quilt, read this chapter. 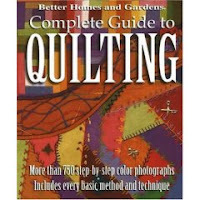 I would definitely refer this book to someone that would like to learn to quilt, if you already know how to sew. My plan is to make my first quilt for my grandmother for Christmas (well, really the 2nd, I'm gonna make my 1st quilt for my dog for practice). I want to some how have all the grand kids in it. I thought this would be easy to just put a bunch of squares together.....right....the hard part is figuring out what squares to put together!! I bought printer fabric paper to add pictures & I have an embroidery machine to put names, sayings &/or designs. I'd love to hear suggestions if you have any--I'm really stuck.